The Economy and Investing: What Lies Ahead? Gain a better understanding of quantitative easing, China, Brexit, the presidential election and other topics of concern to all investors. Hear about the current economy and insights into what the future may bring, including an update on Federal Reserve policy on interest rates and the unprecedented expansion of the Fed’s balance sheet. The event will commence with a buffet breakfast and networking at the Lake Forest Club, followed by the featured speaker. The Economic Breakfast will bring together an audience of over 200 local business owners, professionals, and community leaders. 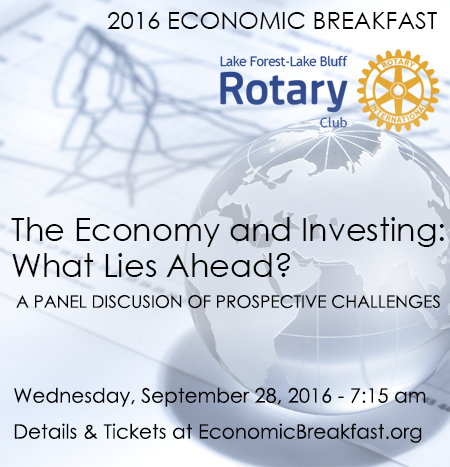 We invite you to support the Lake Forest–Lake Bluff Rotary’s philanthropic mission. For the past 55 years, the Rotary has given over $1 million to improve the lives of others in our community and our world.